I didn’t know if I was going to enter until the last minute. Theme seems fun so it’s nice to be back. Listening to Nightwish and Sabaton. I’d always wanted to make an arcade game but for some reason never did. This might be the time for it. I hope I can finish in time and hopefully the game will be good enough. I’m with you on this Ludum Dare for the 4th time in a row! Some more progress with Director’s Cut! Post compo version is coming along pretty nice. Since last weekend I’ve added a new background and some tunes. Now it was time to tweaks the controls a bit and put some emphasis on characters animations. Check out the game in motion with this gif and give it a try if you haven’t. With three Ludum Dare in a row, one would think that things would be easier. More experience handling the stress, better use of time and some more advantages. The truth is that this was my third Ludum Dare and the most complicated of all. Moonlit Crawlers has been in my head for a while now and when I knew the theme of this edition I knew it would be a good opportunity to make it a reality. Unfortunately the game was more complex than expected. I decided to incorporate some features that I haven’t try before, like Ladders, Ropes, Day/Night cycle and a Collapsing Bridge. All within the same screen. I may have taken the theme too literally. However, after two days of madness and although I could not complete the game as I wanted (I had no time to add sound, for example) Moonlit Crawlers ended up being a good start and left me wanting more. So I decided to continue working on it, as if Ludum Dare had not ended. Thus was born the Director’s Cut version that I share with you now. Introducing my first October Challenge game ever! Hello friends, recently I was scrolling my twitter feed like any other day until I saw something that caught my attention. October Challenge! You may say I have been living in a cave the last few years, but I must say I had not heard about this before. As soon as I read it I knew I would enter. Ludum Dare has given me moments of unparalleled learning and the opportunity to experiment and create new ideas for games. I have no doubt that this will be one more. My game for October Challenge will be one that I have been cooking for over a month. A quite simple idea: what happens if you take an auto-runner, a classic story and a character that is cute even when he dies? And he will die a lot, at least until you master the game enough to make it reach its destination. The game has 78 levels planned, divided into 4 worlds. Each with their own obstacles and traps. It will be initially available for PC, Mac and Linux via itch.io. Now you know how this works, you try the game and if you like it, you pay what you want and what you can. Right now I’m working on the rest of the levels and on a port for Android and IOS that will be free for those who purchase the first version. For now I leave you with some screenshots and I hope to share more information with you as soon as possible. I almost didn’t make it this time, but in the end everything went well. My first participation in Ludum Dare was in the previous edition. I remember that time I was scared because it was a new experience. I had little time developing. My skills as a fast developer hadn’t yet been tested. My last game had taken six months to get ready, so thinking about creating something moderately decent at 48 hours was a real challenge. However, I survived that experience and I was very happy with the result. This time, things were a little different. The date of Ludum Dare 30 coincided with my vacation, so there was some family activities planned that I shouldn’t or wanted to avoid. That made it nearly imposible to enter the Compo and had me settle with the Jam, even following all the rules of the frenetic 48 hours edition. But my first Ludum Dare had been so rewarding in terms of fun and learning, that I was determined to enter again. When the complex and interesting theme Connected World was announced, it was clear that I would not let it escape. In my time zone, the theme is announced at 8 pm on Friday, so from that moment I began to think of an idea. Nothing occurred to me, the theme seems terribly difficult so I went to my sisters for aid. We were brain storming for a while until the idea of a frantic RPG where worlds were constantly changing and you have to switch weapon even faster to stay alive came and we found it great. It had that mixture of madness with an air of “it might work”. When it comes to themes for Ludum Dare I like to stay with the first complete idea that comes to mind. I know that if I think too much I begin to look for detail and I’ll end up finding enough cons to not choose it. So I prefer to begin work immediately on the idea, with a competition like this there is no time to be too insecure with your ideas. Take one and go forward. It is the only way to do it in time. Though it seemed crazy at first, the idea began to take shape as it went. Unlike last time, I decided to start with the mechanics and leave the graphics for last. That way I could feel that I had a game ready before making it pretty. The goal was to have the main mechanic ready at the end of day one (Saturday). I was going to the beach on Sunday so I could not participate. I will be back on Monday to tacke tha art and hopefully finish before delivering time at 8 pm. This was fulfilled so well it’s scary. At 6 pm on Monday, I had the game ready and it was time to play test. Watching my sisters getting angry and hitting the retry button again and again with a smile was gratifying. It was proof that the game was just what I wanted: hard and addictive. Happy with the result, but without being able to believe it was done so fast I used the last few hours to create assets, prepare gamejolt page and take some screenshots. I managed to finish everything on time and by 7:50 I was sumitting the game. Because of this, I thought of creating a post compo version with some adjustments, but when I started thinking about it I realized I had enough material for something else. Something more elaborate, more complex and more fun. So, I decided to take the next step and make “I think I broke something” a fully fleshed out game. You have no idea all the thing I want to add to it and that wasn’t possible with the limited time. So you can be sure that the final version will have enough material to keep you glued for a while. I want to keep the simplicity of design while adding additional content, along with all the feed back I have received from the community, I’m sure I have enough to enhance the experience. First I will finish my current project Taita: Rise of the Half-breed, and them, thanks to Ludum Dare, and have a worthy successor. Ludum Dare 30 was as frantic as before, but even more satisfying. The community response has been overwhelming, beside the weak points, “I think I broke something” has received many positive comments and that’s rewarding. I’m glad I participated, for sure this new edition was as rewarding as the first. I feel that with every Ludum Dare I become a better developer and although I’m still a long way from the top, there is no doubt that the Jam is the right place to having fun and to learn. Stay tuned for more progress and expect great things from “I think I broke something” in the near future. Meanwhile enjoy the current version, and remember Play, die, be upset and play again! Gamedev is better with family! This weekend was complicated. But in a good way. Since I’m on vacation, I had to choose between spending time with family and working on my game for Ludum Dare 30. Of course, family comes first. But fortunately having family nearby always has its benefits even when you’re creating a game in no time. After working all Saturday in programming and devote Sunday to enjoy the beach. I came back on Monday to finish all the art. My sisters kept everybody away from me and were playtesters, my mom cooked some nice meals (mom is great) and dad for the most part didn’t understood what was happening. In the end I was able to finish the game in time for the Jam. I like to participate in Compo because I usually work alone, but seeing how thing went this time could easily be considered as a team work. I am very happy with the game. It was fun working on it and it is gratifying to see that many people are having a good time with it. Ludum Dare is a unique event and each time gets better. I hope you enjoy the game and continue to share these moments of creativity but above all always remember to mix it with the non-digital world. It is a strange world, but it can be equally rewarding. I’m AJ, solo gamedev from Venezuela. Mostly I go by my studio name Otrora Interactive (Working title). Since I don’t have much time because of muggle work I like to play simple yet fun games. I ended up wanting to make the same type of games I love. 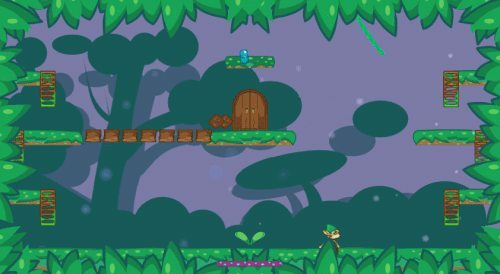 Simple and compiled little adventures that you can pick up and play. I’ve been learning a lot the last twelve month. Making some silly games and other that wasn’t that bad. My last entry on Ludum Dare was a real challenge and teach me how to organize my time and that making a game in a few days was possible. It ended up placing around #200 on design category. That was a surprise. This time I’m a bit less scared because I know what to expect, but equally excited to join the ride. I know I will learn a lot from this second time around and hope to make a game that you all enjoy. So cheers! Let’s make something great! 32 queries executed in 0.130 seconds.